The creative minds behind the Vitra aluminium chair family are Charles and Ray Eames, masters of their craft and guarantor sof clever designs - the Eames Plastic Chairs and the legendary Lounge Chair, for example, also come from the two furniture designers. 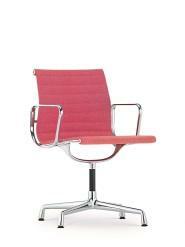 Over the decades, the Aluminium Group has become a classic of modern furniture design. Originally, the Aluminium Chair was designed for a private home in Columbus, Indiana, built by architects Eero Saarinen and Alexander Girard in the mid-1950s. With the chairs two pliable aluminium braces carry the aluminium chair, which, not least thanks to its adjustable backrest mechanism, makes high seating comfort a standard. The exposed construction with the minimal mesh, fabric or leather upholstery visually creates a slim silhouette that makes the designer chair an elegant office and conference chair. The brilliance of the metal construction is again contrasted with the flexibility and liveliness of the fabric or leather covers. With its novel and intelligent combination of materials, the Eames aluminium chair embodies dynamism and flexibility as well as confirming status. The aesthetics of Vitras Eames design has lost none of its relevance since the fifties - the variants of the Vitra Aluminium Chairs are still regarded as absolute classics. 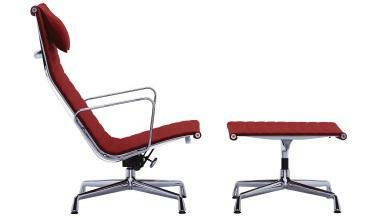 Not only in the field of office and conference chairs, but also in the lounge and living area, the Eames chairs impress with their classic shape and stable construction. The aluminium chairs have been produced by Vitra for decades in consistently high quality, and Charles and Ray Eames are still the cornerstones of the portfolio and the philosophy of the Swiss furniture manufacturer. Following the tradition of thinking of Ray and Charles Eames, one of Vitras most important principles is to guarantee the longevity of their products: a 30-year guarantee is therefore granted on all Aluminium Chairs. 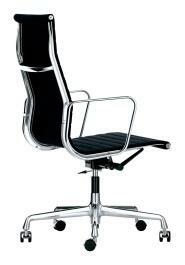 The Vitra aluminium chairs have long been regarded as classics in work and domestic areas; all are characterized by their frame made of die-cast aluminium, which are available in chrome or polished finish, and the stretched seat/backrest - available in textile , mesh or leather. Thanks to the castors or glides, they move perfectly on hard or soft ground as needed, allowing them to be used in any room. In addition to different chair models with different heights and backrests, with and without armrests, with and without castors, as well as different coloured fabric and leather upholstery, this Eames furniture series by Vitra also offers two stools and a lounger. All three versions are based on a four foot base and are not height adjustable. In contrast to the models EA 105, EA 107 and EA 108 they are characterized by a narrower, shorter seat. The EA 101 is not rotatable and has no armrests, the EA 103 is not rotatable, but has armrests and the EA 104 swivels and has armrests. 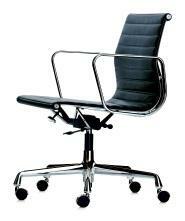 In versions with leather cover, the backrest is made of fabric Plano, a leather backrest is possible for a surcharge. These versions are based on a non-height adjustable four foot base. The EA 105 is neither rotatable nor does it have armrests, the EA 107 is also not rotatable, but has armrests and the EA 108 is swivelling and has armrests. The height and surface are slightly larger than those of their smaller colleagues EA 101/EA 103/EA 104. With leather upholstered chairs the back of the backrest is in the Plano fabric, a leather backrest back is available at an additional cost. The versions EA 117 and EA 119 are based on a five foot base with castors, which are individually adapted for hard or soft ground. Both are rotatable, height-adjustable and have an adjustable reclining mechanism, but the EA 119 has a higher back than the EA 117. In versions with leather covers, the rear of the backrest features colour-coordinated Plano fabric, a matching leather version is available at an additional cost. These models, based on a four foot base, are tilted a little more backward than the other models. Both the EA 116 and the EA 124 have armrests, but the EA 116 is rotatable while the EA 124 is not rotatable. However, this has an adjustable reclining mechanism, is a good deal higher and can be perfectly combined with the footstool EA 125. If the chairs are covered with leather, the rear of the backrest is covered in a coordinated Plano, a leather backrest is available at an additional cost. 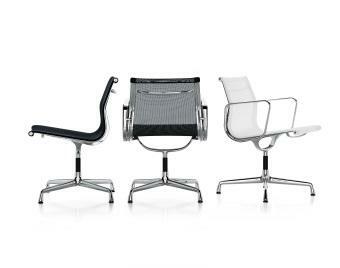 The Vitra Soft Pad Chairs were presented in 1969, ten years after the Aluminium Chairs. 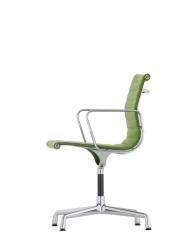 They resemble the aluminium chairs in their shape and are also based around two pliable, aluminium braces. Unlike the aluminium chairs, however, the Soft Pad Chairs are much more voluminous, being as they are upholstered with soft seat cushions. They are primarily found in office and conference rooms and promise high levels of comfort and seating security.